After four fabulous years in Australia, I made the decision to move back to the UK this month. I’ve been asked lots of questions about my reasons why, and how I managed to transport my life from literally one side of the world to the other so this post is dedicated to the reasons behind the move. My next post will tackle how I packed my life into three suitcases without shipping anything back! Back in December, I received my Australian Permanent Residency which is valid for 5 years with room for extension. If I decide to make the move back to Australia, I can also apply for my citizenship. This gave me a lot of flexibility in my decision for my move to the UK. 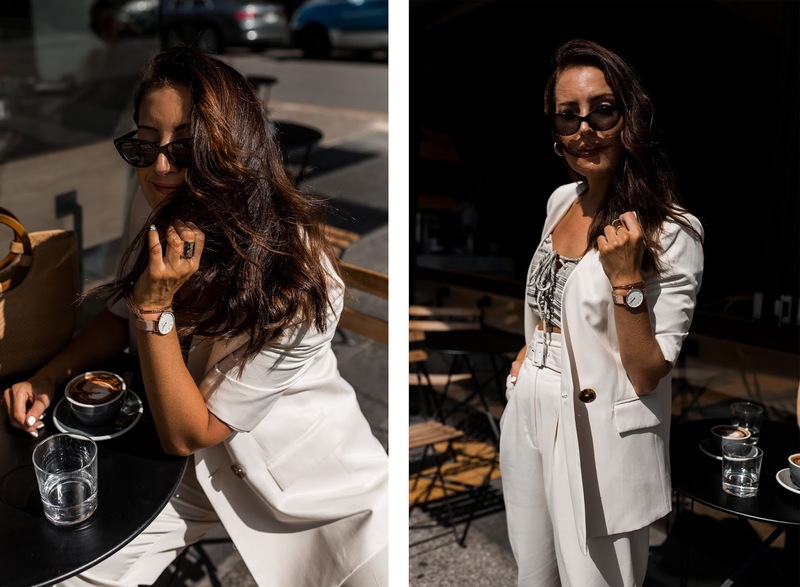 I left my full-time job in social media management back in February to pursue Style Structure full-time which meant I didn’t have a job keeping me in Sydney anymore. I have a terrible habit of planning way too far in advance, but for once in my life I am going to see how this year pans out without having expectations or putting pressure on myself. So why the move back? I had been toying with the idea since my trip to Ibiza last September - in case you didn’t know, I used to live in Spain and being back there made me miss being close to this part of the world. 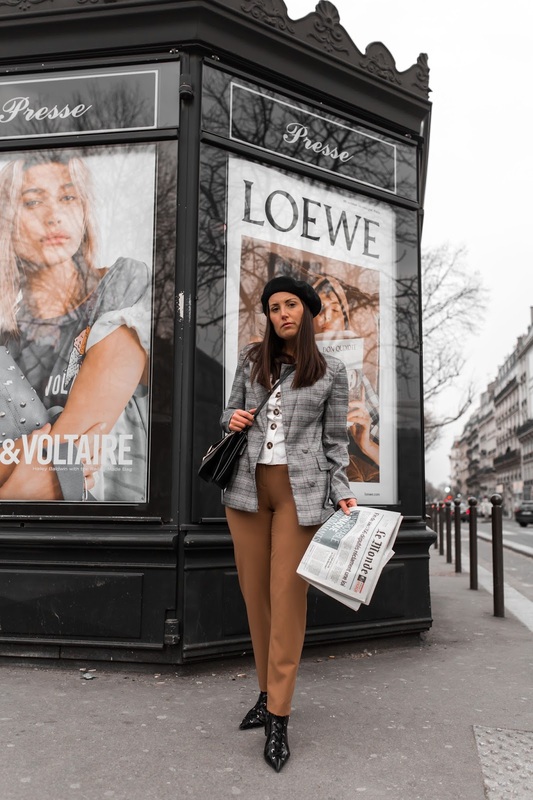 I created some of my most meaningful content there, and then again in Paris in February. It made me realise I never really embraced the beauty of Australia enough in my imagery (well maybe the amazing cafes! ), but the stunning beaches and coastlines were absent. 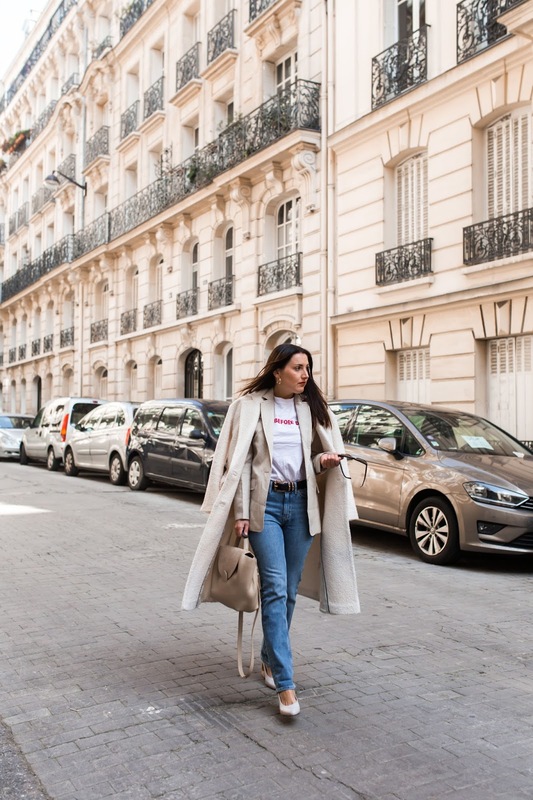 I’m primarily a style blogger and love city life, so it makes sense to be closer to Northern Hemisphere trends. The climate in Sydney makes this part of my job a little difficult. As you already know, I shoot the majority of my content on a tripod. 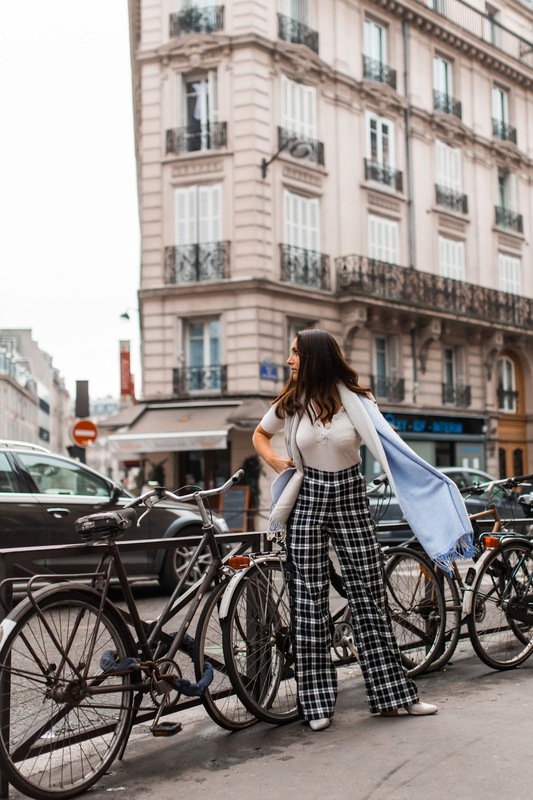 All images in this post are from my time at Paris Fashion Week and were all shot self-portrait. I love to shoot lots of outfits in one day on what I like to call ‘content trips’. When I arrive in a new city, I will have a day location scouting, then I set up my wardrobe to match each look to that location. I like to treat these outfits as a campaign, similar to how brands shoot; taking in the mood and having a concept. I am now much closer to Europe, so I am planning on taking these trips every 4-6 weeks, which also means I can show you guys new places you may have never been to before. There’s something so exciting immersing yourself into a new place, unsure of what the locations are like until stepping off the plane. It pushes your boundaries, and makes you focus solely on creating work you can be proud of. If you are a planner like me, this technique will also get you out of your comfort zone. I highly recommend the book ‘The Subtle Art Of Not Giving a F**k’ to help any of you creatives looking to start self-portrait photography. There are so many points in the book which I really relate to, especially the section dedicated to enjoying the climb instead of purely focusing on the end result. Self-portrait photography is a lot of trial and error, and the reason I choose to take the majority of my shots is because it’s unpredictable. Sometimes your concept isn’t what you hoped for, but persevering, changing certain factors will make you love that image even more because you had to adapt and learn from it. And lastly, I finally have a place of my own! You know how much I appreciate design and interiors so it made sense to move back to my hometown Cardiff (which is only 2 hours from London) to make my creative space work for me. Sydney is one of the most expensive cities in the world to rent and buy, and for just a little more a month I can have a spacious one bedroom apartment all to myself in comparison to a room in a shared house. I love to shoot indoors, so slowly but surely I’ll be getting the place up and running so you can see more of my new place incorporated into my shoots. I hope that answers the majority of your questions, and I can’t wait to share my next post on how to pack for moving overseas! This week has been dedicated to packing my four years in Australia into two suitcases! It wasn’t an easy task one bit. I thought I would have been able to do it in a couple of days but it has literally taken me over three weeks to decide what to cull and what to keep. Because lets be honest, no one wants the extra costs of kilos at the airport! There were a few things I definitely kept hold of, either because they are seasonal staples or for the reason they are timeless accessories. I’ll be doing a more in depth packing post upon my return to the UK, but until then I am sharing the accessories I have kept a tight hold of. One piece I didn’t part ways with was my Daniel Wellington watch. I think having a small yet curated collection of accessories can really elevate your wardrobe. For me, that includes a few timepieces that all differ in some way - i.e, a contrasting watch face and neutral straps in different fabrics to match the majority of my looks. It’s always great to have the option of a mesh strap (great for evening or tailored looks) and a leather strap (my go to for casual or denim looks). I'm a minimal jewellery kind of girl, so my watch is usually the stand out piece. You’ve only got to spot a coffee shot on my Instagram to see what I mean! 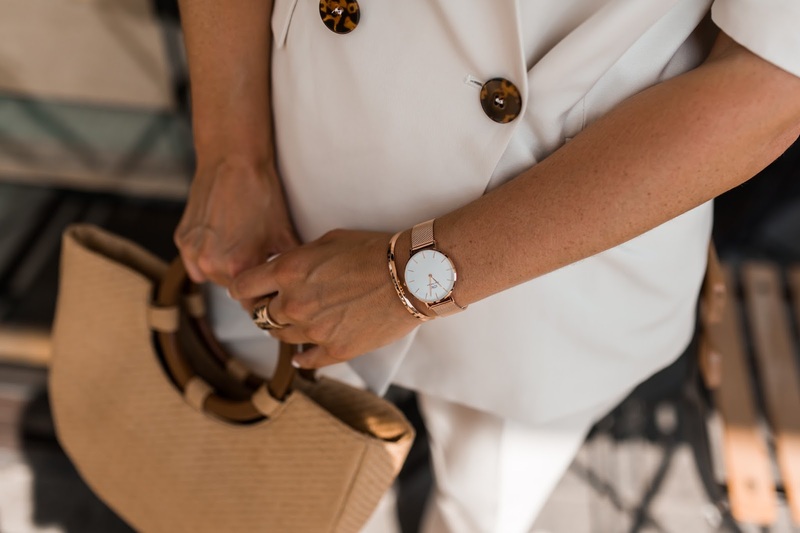 I have styled with the Daniel Wellington cuff which comes in silver or rose gold. Handbags in monochromatic colours are a great option for styling. When packing everything into two suitcases the less handbags the better to save space, so I have definitely culled a lot of ‘fashion’ bags this week. I think keeping a tote, a cross body, and a shoulder bag is enough. Any bag that’s a trend piece that I can buy at a reasonable price point I will wait to purchase back in the UK. I have also kept hold of a handful of earrings - a few statement and small everyday styles all in gold. 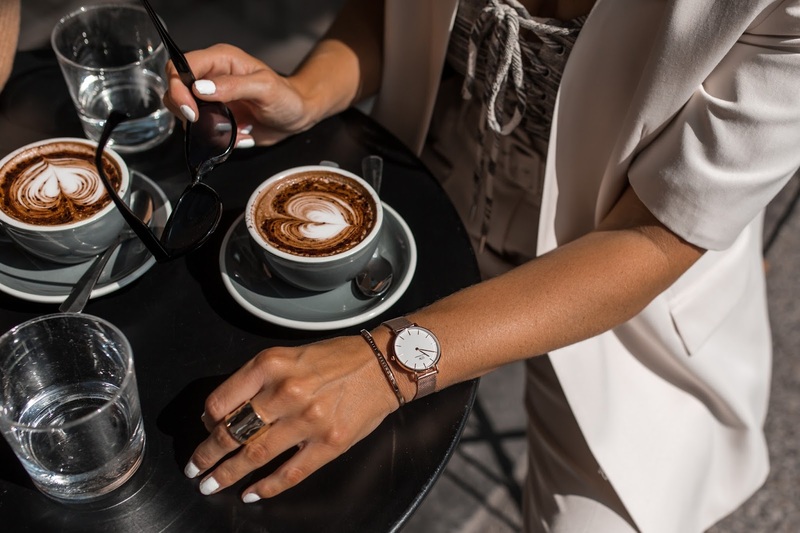 Daniel Wellington are offering a free strap when purchasing a watch offer and an additional 15% off with code ‘STYLESTRUCTURE’ until May 31st. For my Australian followers, the gift sets are a great option for Mother’s Day next month. I actually purchased one for my mums birthday last year and she loves it!